We are only four months from our anniversary trip to Italy and we thought we’d share one of the pieces from our itinerary. 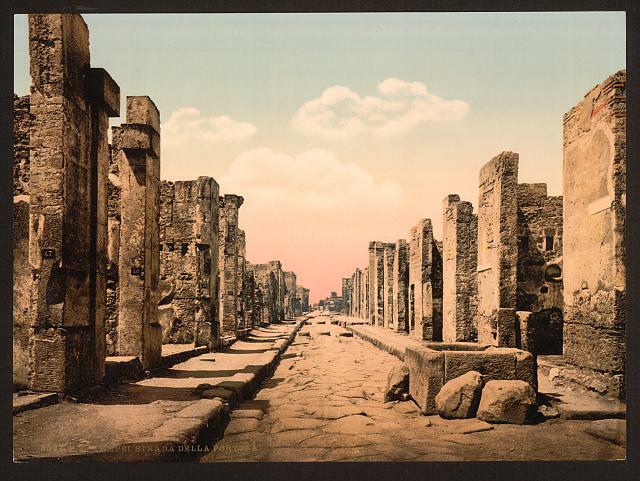 We’ve tried to incorporate a visit to Pompeii on our previous visits to satisfy our love of history. The time and distance of Naples (Pompeii) from our beloved Tuscany has always become an obstacle. If you don’t know, and that would be odd because our readers are pretty smart, Pompeii is a ancient Roman city that was covered in ash in 79 AD by a volcano — virtually freezing it in time. We are determined to visit the ancient unearthed city of Pompeii, so we had to get creative. We’d normally take a flight that lands at Amerigo Vespucci Airport (FLR) in Florence and fly out of there as well because it’s easy and familiar. If you fly, especially internationally, you understand that flying in and out of the same airport is most often a big cost saver. But you have to weigh that cost savings with the time and priorities in your itinerary. On this trip, we’ll fly in and out of separate airports. At first we looked at doing the obvious, flying into Naples and out of Florence, but that would that cost almost $100 more for us than flying into Rome and spending the night there. So that’s our plan: Fly into Rome, spend the night a hotel and join a tour for our exploration of Pompeii. After that, we’ll drive north to Florence and fly home via Amerigo Vespucci. We’ve selected the Walks of Italy Pompeii Tour From Rome With Amalfi Coast Drive for €169 per person. We’ve had great experiences with Walks of Italy tours for a decade now and have no doubts that this will be an amazing tour. The tour will pick us up in Rome and drive us on a tour bus with only 15 other guests down to Pompeii. We will skip the ticket line as all the arrangements will be in place to get us in the park with as little wait as possible. The tour is led by an expert guide, often someone has worked as part of the archaeology team on the site in the past. We will be guided down the unearthed streets of the city to see examples of well-preserved homes, businesses, shops and baths as well as the famous brothels with their detailed mosaics. We are both excited to see the death casts, the frozen forms made from injecting plaster into the cavities created by the poor people trapped by the falling ash of the erupting volcano. The tour then continues on a down the Amalfi Coast to the seaside town of Positano, (yeah that town where Diane Lane gets drunk on limoncello in Under the Tuscan Sun), for some time to explore the pastel town and eat lunch before climbing back on board and driving back to Rome. The day will be a long one, the trip spans 13 hours, but it is one of the least stressful ways to pack in an adventure to southern Italy. We know we often talk about how you don’t want to plan out every minute of a vacation because nothing ruins the relaxation like watching a clock. But we’ve also found that sometimes the best choice it to let someone you trust handle the hard parts like transportation, tickets and finding a tour guide so you can relax and focus on the sights, sounds and experiences the trip has to offer.